The way to Birtham was dusty and the mud flats of the plains gave way to rugged foothills. They spent the night camping in a protected wadi, then rode down to the basin of the frontier outpost. Round walls rose on a flat, dusty plain; groups of slaves were seen collecting the valuable resin from thorny bushes in the hillsides. The gatehouse was manned by a detachment of bored, sweating guards. The guards did not know of any Galaf, but let the travellers in to the wide, windswept courtyard. There were some stables and barracks here, a keep with a tall tower, and a caravanserai. The owner, Begshir quickly fetched some food and drink, and answered questions as he could. It turned out there was indeed very little traffic in the area. Birtham was a keep on the borderlands, and beyond were bandit-infested wastelands to the west, and the heretical fanatics of the Waste of the Unbelievers lurking in a ruined city beyond the southern mountains. 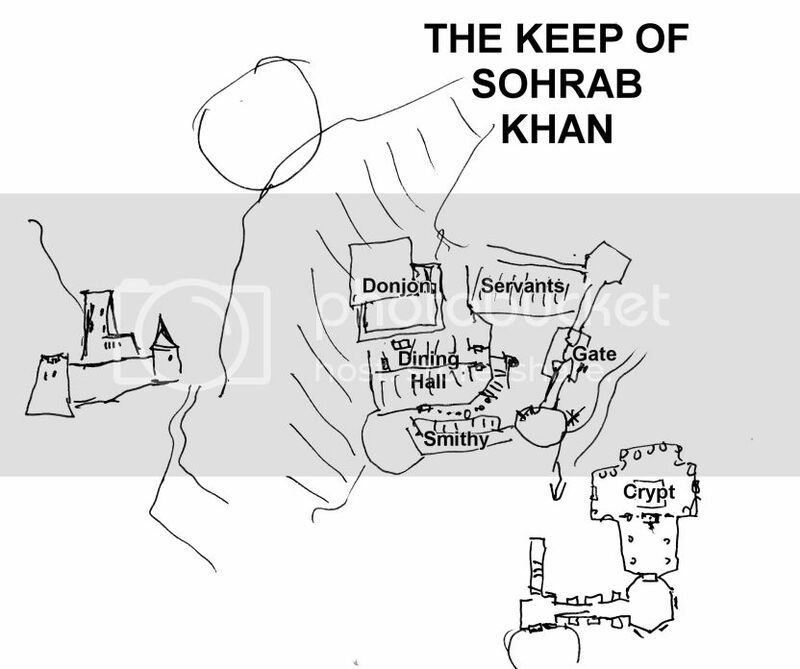 The keep itself was the only bulwark against these forces, although there had once been a smaller outpost on the southern pass named The Keep of Sohrab Khan. This was a ruined structure, whose owner, a steadfast old warrior, had refused to give it up when he was ordered to retreat to this place some two hundred years before. The fort was now deserted. 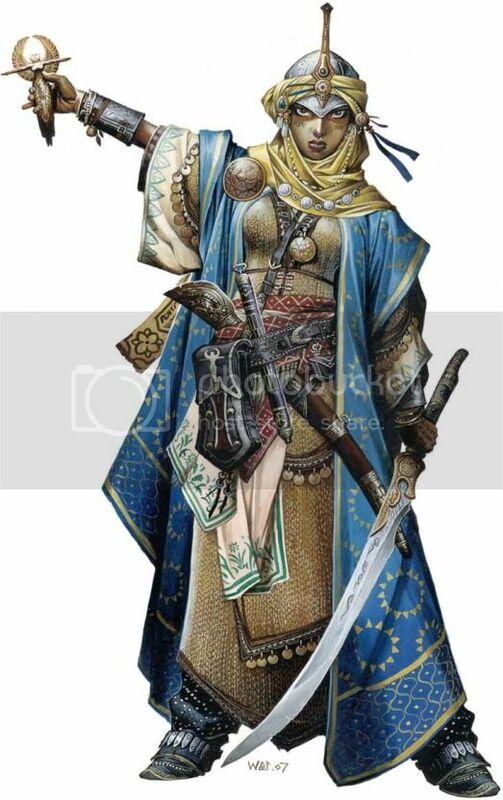 Only two visitors had come in the last few weeks: one, Ram Golab, was a merchant involved in the resin trade; the other a fighting woman with noble features, who had spent some time here, consulted the master of the keep, but left weeks ago. Burzasp, Vifranavaz and Marasura decided to pursue the leads a bit more. They asked for an audience with the castellan, and were soon escorted to the reception hall of the central keep, where an old, bearded sage was involved in a complicated game of chess he was playing against himself. He was happy to see visitors, and introduced himself as Kuraddin Mirza, asking the servants to fetch drinks as he asked of the recent news, and told about the local circumstances. His main problem was Razi Yazeb, whose robbers would strike from the hills, then retreat before he could muster his forces. Birtham’s men were stretched too thin to supervise the slaves, guard the outpost and chase after swift and experienced riders. Anyone who could bring proof of Razi Yazeb’s demise could keep his treasures, and receive an additional 400 gp bounty. A fighting woman by the name of Gulafshan Zer? Yes, she had been here two or three times, looking for something, but there had been no news of her recently – if she was in this area, nor the guards nor him had seen her. After the audience and outfitting themselves, the characters turned their eyes on the southern fortress. It was maybe half a day’s ride from Birtham, sitting below steep mountains. A serpentine road wound its way up, offering sufficient concealment to pass undetected. They left Birtham through the eastern gate, riding back towards Arfel, then struck for the hills where Marasura lead them to the southern road. They rode their steeds as they could, and as night fell and the shadows darkened below the black peaks, they stood before the ruins of the Keep of Sohrab Khan. The keep was in better shape than they initially anticipated. The wooden gate lay in ruins and the courtyard was choked with fallen rubble, but the walls and interior structures were mostly intact – particularly the peaked roof of the dining hall and the towering donjon of the central keep. The crumbling statue of a tiger guarded the stairs leading to the keep’s front door, its paws clutching a coat of arms depicting a tiger’s head superimposed on a round shield and weapons. Tethering the horses and entering the courtyard afoot, they suddenly froze and listened. There were unmistakable sounds coming from within the hall – whining fiddles, bagpipes and drums, and the noises of cavorting men. The party looked around. There was no sign of horses or even any life on the outside. A smithy and what seemed to be a two-floor servants’ quarter lay still and vacant. It was decided that Burzasp would sneak around by himself while the others waited, and he would bring news to them after he was finished. Avoiding the front, he snuck along the stone footpath along the southern wall of the dining hall. The path lead to a decorative iron door at the base of the wall. Cool air wafted from a barred opening. Burzasp tried the lock, but as he fumbled around without a light, managed to break his set of lockpicks in the process, and the door did not budge a bit. He cursed silently, and choosing another approach, he threw a grappling hook on the roof of the smithy. The structure was old, but did not break under his weight, and in an instant, he was up on the parapets. The doorway in the side of the great round bastion was open, and lead into a circular hall. The noises came from the north, from beyond a passage. He slowly crept ahead, surveying the dusty and cobwebbed statues and banners around him. There was light in the great hall and noise, and he snuck on to a wooden gallery, looking down to the scene below him. The dining hall was occupied by a long wooden table, illuminated by several braziers and candles. Men in peaked helmets and mail were sitting on ancient chairs, reaching into bowls and plates brought before them by ragged figures. They were all clad in voluminous desert cloaks, showing no faces or extremities, and all Burzasp could see was the glint of their eyes. Behind them, dark musicians on a bench played wild and screaming tones, drowning out the noise. But it was the end of the table that drew his interest: two wooden thrones stood below colourful but faded banners, and they were both occupied. One of the figures was an older man, white of hair and pallid of skin. He wore black and red clothing befitting a nobleman, and was clinking cups with his companion, who seemed lost in reverie. She was a young woman, with slightly plump brown features, but an unmistakeable beauty. She wore a peaked helmet and a mail coif, gold-plated chain armour underneath her sky-blue clothes. She looked upon the other with a warm smile, and spoke something Burzasp could not hear. “Gulafshan Zer!”– Burzasp exclaimed silently. From atop the gallery, he counted at least two dozen seated men and half as many servants, but also noticed more ominous signs: the food on the plates was dust and ashes, and the bowls contained no meat but gnawed bones. It was time to get the hell out before he was discovered. He retreated as silently as he came, and thought to survey a bit more of the keep. From the first floor of the bastion, he climbed the rickety ladder to the top, when there was a crash, and he fell as the ancient thing disintegrated under his feet. Aching and cursing, Burzasp decided to try the roof of the great hall instead, but missed another step and fell with a loud crash into the courtyard. He froze, suppressing the pain and clutching a dislocated leg, but no noises were coming. Apparently, the revellers did not notice or did not care. Shuffling and hobbling along the deserted smithy, he hopped back to his companions. Original date 1 April 2012. I just wanted to say that I have loved reading these campaign journals. The shear imaginative force of Fomalhaut has been really inspirational to me. I have fallen behind schedule, and have three sessions worth of play to write up, but I’ll try. Hello, I would like to come in contact with you regarding your module “The House of Rogat Demazien”, but I did not manage to find another way to contact you. I have started a blog where I review old school style modules in swedish, and I would like to use images from your module in the review if possible. Please contact me if you have the time! Jonas– oops, sorry for not reading this post before. Sure, go ahead! Alternatively, you can also mail me at: [gabor] [dot] [lux] [at] [gmail] [dot] [com], and I will respond faster.